The holidays are officially upon us, and we all know there’s nothing better than celebrating the season with friends and family… OR sitting in a comfortable chair in blissful solitude while enjoying a glass of whisky. 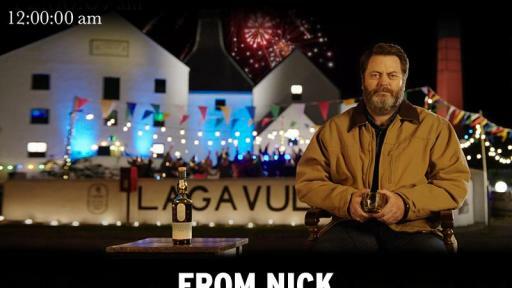 Lagavulin Single Malt Scotch Whisky and everyone’s favorite silence-savoring, whisky-sipping companion, Nick Offerman, set digital screens ablaze last year with Yule Log, providing the most enjoyable fireplace-viewing experience of all time. You can replace your sequins with sweatpants (although sequined sweatpants are strongly encouraged). Sofas are always more comfortable than nightclubs. Always. Waiting in line is the worst. Skip the line at the bar and pour yourself a drink of Lagavulin. Then, sit back and relax. Responsibly. You’ve earned it. You get to escape the utter chaos and madness that is Times Square on New Year’s Eve and instead be transported to the mecca that is the Lagavulin distillery. Nobody to kiss at midnight? No problem! 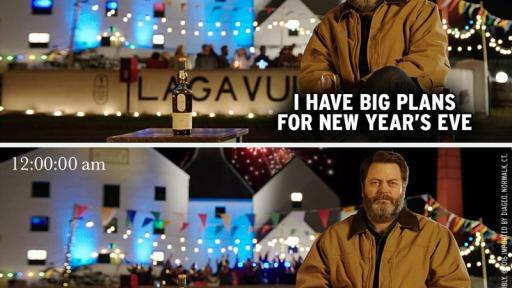 Avoid the anticipation of an awkward, or at the very best, anticlimactic start to the New Year by getting lost in the mesmerizing eyes of Nick Offerman. 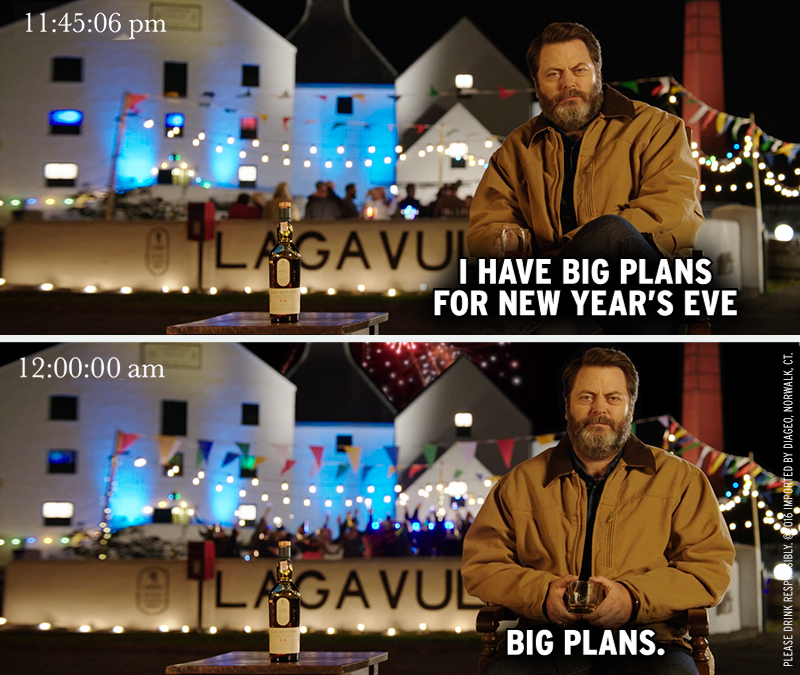 Offerman says, “I never make New Year’s resolutions because I apply myself to every day of the year in a fashion that can only be described as ‘resolute’. Because I am not a fool, my determined recipe for delicious living naturally involves a responsible savoring of Lagavulin. Follow Nick’s lead and bid farewell to 2016 by boycotting the Times Square Ball Drop. 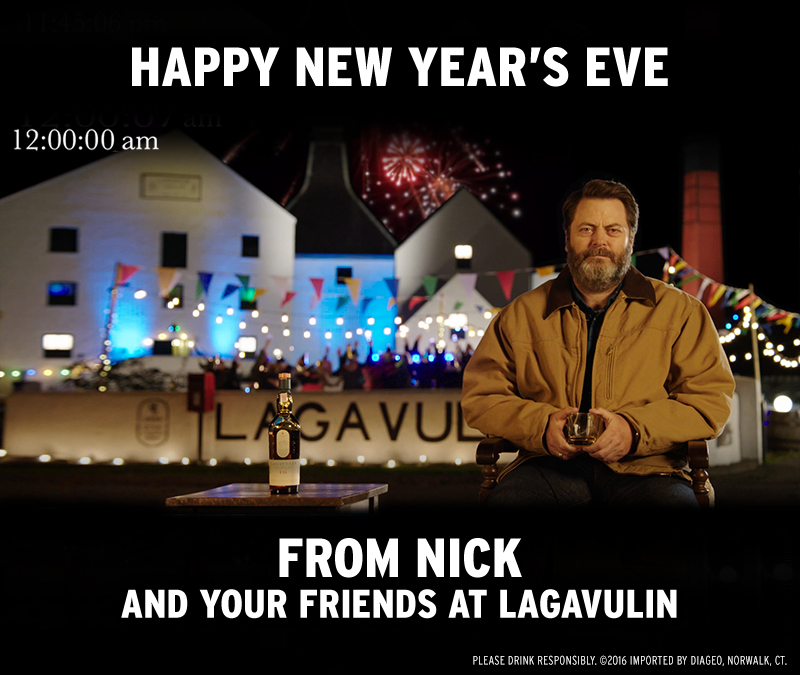 Instead, spread the spirit of the season (Lagavulin, of course) with friends and family by streaming his New Year’s Eve video during your holiday gatherings. Everyone will be impressed by your quality taste in entertainment and scotch. As we toast to new beginnings in 2017, we also fondly reflect on the past year. 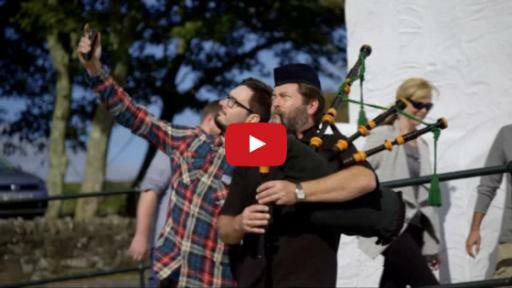 Lagavulin celebrated its 200th anniversary in 2016, and to keep the party going, there are two new additions to the My Tales of Whisky series: Nick the Bagpiper and Treasure of Lagavulin. 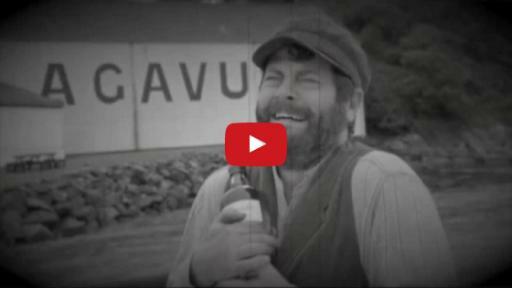 These videos delve into the history and tradition of the iconic brand (and might even be semi-true). One tells the thrilling and fascinating tale of how Lagavulin came to be. The other has bagpipes. Nick Offerman is an actor, humorist and woodworker, best known as the character Ron Swanson on NBC’s hit comedy series “Parks & Recreation.” He operates Offerman Woodshop in Los Angeles, where he and his co-op build custom furniture, canoes, ukuleles and other sundry items. Offerman has authored 3 New York Times bestselling books, “Paddle You Own Canoe” (2013), “Gumption” (2015), and “Good Clean Fun” (2016). He can next be seen in The Weinstein Company’s film THE FOUNDER opposite Michael Keaton and John Carroll Lynch and recently wrapped production on the films THE LITTLE HOURS and THE HERO. 2016 is a year of celebration for the iconic Lagavulin, marking the distillery’s 200th anniversary. Famous for its majestic nose of Hebridean peat smoke, richly textured and complex flavors, Lagavulin encapsulates the passion, heritage and skills that lie behind its crafting. Treasured around the world as one of the most special Single Malt Scotch Whiskies, Lagavulin has been commemorating its bi-centennial anniversary in a big way. To honor this monumental anniversary, the distillery has released two limited-edition whiskies, Lagavulin 8 Year Old and 25 Year Old, and welcomes fans around the world to enjoy a dram and toast to the 200th anniversary.